Not huge, but started at least. I started off knitting it on Addi Turbos but have just switched to a rather mismatched pair of needles (both 5mm but the children sat on the pair of each needle and broke them at some point!) as I remember from past Birch experiences that Kidsilk Haze drives me crazy on circular needles. 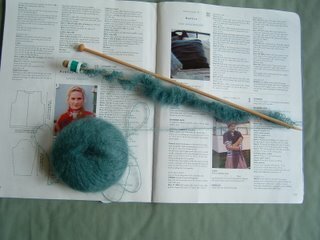 I think I also need to find some mindless knitting to be getting on with at the same time (on the bus, at knitting group, etc, when I can chat and knit at the same time) so plan to rummage through my projects this weekend to find something else to do at the same time. I quite like Vogue Knitting, although I see that in this issue, as in recent issues of Rowan, crochet is becoming increasingly intermingled with the knitting patterns. As someone who does not crochet I find this a bit irritating, but maybe I should pick up a hook and learn! Hi Ingrid, your Birch shawl looks wonderful. I love the colour, it is so rich and jewel like. You are a fantastic knitter to tackle what looks like an extremely complicated pattern. And in Kidsilk Haze!